When Pokémon: Black and White was released in Japan, the three "starter" Pocket Monsters were called "Tsutaaja", "Pokabu", and "Mijumaru". Tsutaaja doesn't quite roll off the tongue. What the internet came up with did. Those guesses at what these new Pokémon look like? Wrong! The grass type Pokémon was dubbed "Smugleaf" or "Grinleaf" — both great names. But Nintendo has now revealed the character's official name. It is "Snivy". Not bad! But not Smugleaf. The other starters are "Tepig", a Fire-type Pocket Monster, and Oshawott, a water type. 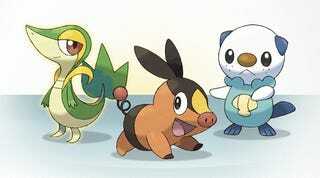 Tepig is "Pokabu" in Japanese, and Oshawott is "Mijumaru". The changes make sense. For example, "Pokabu", which has a word play on "buhi-buhi" (the Japanese for "oink oink"), works better in English as "Tepig". Shame about Smugleaf, though! But Snivy it is.